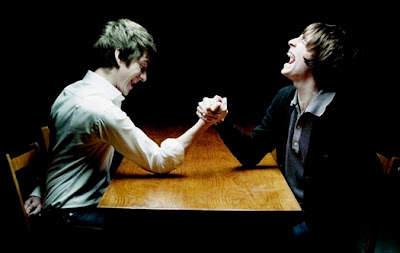 Arctic Monkeys frontman Alex Turner has teamed up with friend Miles Kane, formerly of onetime Monkeys tourmates the Little Flames and presently of the Rascals, for a forthcoming LP.Calling themselves the Last Shadow Puppets, Turner and Kane will release their debut, The Age of the Understatement, via Domino on May 6th. The disc features production from Simian Mobile Disco's James Ford, and packs in 12 tracks. Orchestration was provided by another young talent: Owen Pallett of Final Fantasy and violinist of Arcade Fire, who conducted the 22-piece London Metropolitan Orchestra for the recording.The world will get a glimpse of the Last Shadow Puppets on April 15, when Domino unleashes a single for title track "The Age of the Understatement" in 7" and digital formats.First the first time in some time, there's not a whole lot else going on with those Arctic Monkeys at the moment, though their own Matt Hedlers did recently remix the Hives.